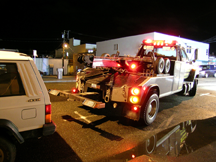 Anytime Towing won't leave you and your vehicle stranded anywhere within our covered areas! So just pick up the phone; we are only a call away. Call now for your free estimate. Be prepared to tell us your location, the pick-up to and from destination, and type of vehicle and receive a free estimate in seconds.